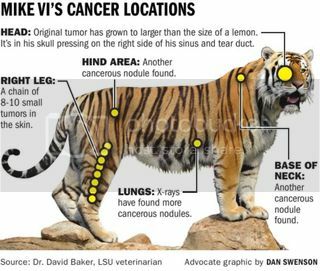 LSU mascot Mike VI passed away Tuesday, October 11, 2016 due to declining health caused by cancerous tumors throughout his body. In May, Mikes caretakers found a rare, lemon-sized tumor behind his right eye, it was determined to be a terminal. LSU Veterinary School in conjunction with Mary Bird Perkins-Our Lady of the Lake Cancer Center treated Mike with stereotactic radiation therapy which initially shrank the tumor. A CT scan earlier this month found that the initial tumor resumed growth, and smaller, nodule-like tumors were found in Mike's leg, on his neck and throughout his lungs. Dr Baker let everyone know Mike wouldn't live longer than a month to two months. Mike was out in his habitat throughout the weekend with many visitors coming to leave flowers, notes and to say their goodbyes. 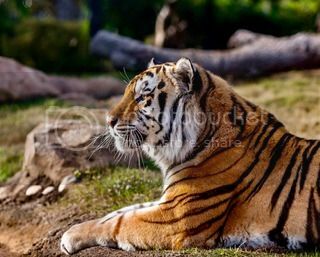 On Sunday it was announced he wouldn't come out of his night house due to his health declining. On Tuesday Mike was humanly euthanized. He will forever live in every LSU Tiger fans heart. It's that time of year again to take a run around our beautiful city and play in some color! This is the third time for us to run The Color Run! Each year they have a theme, last year was "shine", we had glittery powder to toss at the finishing party! This years theme is Tropicolor...Escape for a mini tropical vacation! At the finish there will be sandy beach, inflatable palm trees, beach balls and more! The Color Run donates a portion of their profits to a local charity in our town...Girls on the Run/South Louisiana Girls on the Run is a transformational physical activity based positive youth development program for girls in 3rd - 8th grade. We teach life skills through dynamic, interactive lessons and running games. The program culminates with the girls being physically and emotionally prepared to complete a celebratory 5k running event. The goal of the program is to unleash confidence through accomplishment while establishing a lifetime appreciation of health and fitness. If you haven't participated in The Color Run in your area...You're missing out on some amazing fun! This is THE HAPPIEST 5K on earth!